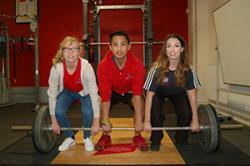 L-R: Catrin Jones, Seth Casidsid & Hannah PowellBangor University Sport Centre, Canolfan Brailsford will be hosting the Welsh Weightlifting Senior Championships event on 12 March 2016. This Championship is considered to be one of the biggest events in the Welsh Weightlifting calendar. Around 50 lifters from across Wales will take part, including Bangor University student, Hannah Powell. Hannah, who now lives in Holyhead, and trains at the Holyhead and Anglesey Weightlifting and Fitness Centre, has held many records for her category and has recently qualified for the European Weightlifting Championships that will be held in Norway in April. This will be the final chance to qualify for points and an opportunity to get selected for Team GB at the Olympic Games – Rio 2016. Also competing is Catrin Jones, 16, from Bangor. Catrin was awarded an Elite Athlete Local Bursary from the University in 2015. In September 2015, Catrin represented Wales at the Commonwealth Youth Games in Samoa where she was selected to carry the Welsh Flag in the opening ceremony and achieved the first gold medal of the games for Wales. Another competitor is Seth Casidsid a Bangor Psychology alumnus and former Bangor University community scholarship athlete. Seth is currently Welsh Open Champion 2015 and Welsh Senior Champion 2015 and was British Silver medallist in 2014. Simon Roach, Weightlifting Wales Performance Director, said: "Bangor University has previously hosted international weightlifting events and we are excited that the University is hosting our national championships this year. Bangor University is one of our National Performance Centres where their top class facilities caters for our most talented and elite Welsh athletes. The high performance training facility, excellent competition provision and support package for athletes allows students at Bangor University to really enhance their weightlifting career." Spectators are welcome and entrance is £5 adults, £2.50 students, children and OAPs.